We offer you one of the most flexible, adaptable and simple event timing solutions. Specialising in working for you, the event organisers. With our systems we are able to work around your registration set up, your race set up and result presentations. With a completely self sufficient system there’s no hidden charges and no hassle for you. We aim to be the easiest part of your event organisation helping to remove the stress associated with providing competitors with results. Keeping organisers happy, whilst most importantly, keeping competitors happy. 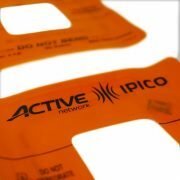 Whether you’re looking for a disposable timing solution or the use of reusable tags we have the equipment to suit you. Unsure of the difference? We’ll be happy to talk through the benefits of either option and using our experience help recommend the most appropriate service. Organiser of a charity event? Let us know and you’ll have access to our separate pricing range. For more of the important details on our service follow the two links below or get in touch to find out what we can do for your event. Our reusable timing chips offer an affordable, re-liable and easy to operate service. With their simple design and numbering system they are easy to distribute at registration and collect at the finish line. They simply tie into a runners laces, being such a lightweight tag has shown no effect or discomfort for athletes taking part. For shoes without laces they can easily be twist tied onto the shoe in a comfortable and secure position. For more information on our re-usable timing tags and for any pricing queries please get in touch. We can offer you disposable timing chips which simply stick on to the back of your race numbers. 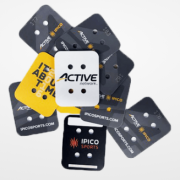 They bring a number of advantages over the reusable tags and have proven popular with event organisers. With the ability to post runners their bibs with timing chips already attached there is no need to worry about distribution and collection at the end of the race. For more information on our disposable timing tags and for any pricing queries please get in touch using the link at the bottom of this page. Before runners get close to the start line you’ll be thinking about how your event registration is going to take place and how best to distribute timing chips to your competitors. Whether you’re considering posting out bib numbers or registering all competitors on the day our timing chips have been labelled and designed to be simple to use and easy to distribute. Providing two 2.5 meter or a combined 5 meter timing matt we have the option to record mass starts easily reducing the chances of runners tripping over each other. Our timing matts are designed to provide traction not trip hazards and their reliability is unquestionable, operational at both the London and Brighton marathons in 2017 and again in 2018. We understand that up-to-date accurate information is essential to an event organiser. Consequently we’ve ensured we can provide you with updates on exactly how many runners have started and how many have finished for any race type. If your event involves laps we can keep track of how many laps each competitor has completed and ensure they’re running the courses full length. When the competitors cross the line we will be there to provide them with an individual ticket print out which contains their time. We can also include your website address on this ticket and a variety of different information. This can include lap times, avg pace, position when crossing the line and both gun and chip time results. With no limit to the number of event categories you can have on the day we are able to provide you with flexible and personal results. Allowing you to schedule award ceremonies and presentations without being limited to the awards you want to give. All our results are uploaded online on the day of the event and we will handle all post event queries regarding timing. We can send you copies of the results in any format, whether it’s Excel, a PDF or a JPEG for your social media posts, we have the ability to match your requirements. We handle any timing queries from athletes and have the ability to update and adjust results after the race. Ensuring runners receive the best experience and don’t miss out on seeing their times online. Video footage of the start and finish line is also captured and available to the event organiser. A welcome addition to online marketing and social media posts. For more information and to receive a quote get in touch and we’ll let you know how we can help.